KALIS, KLEIMAN & WOLFE has extensive experience litigating complex construction litigation disputes and matters. The firm handles all types of construction claims on behalf of owners, developers, investors, lenders, engineers, architects, contractors and subcontractors. 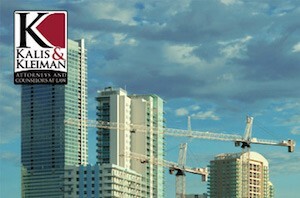 We also regularly work with creditors and debtors in construction-related foreclosures and insolvencies. Our real estate and construction litigation attorneys are experienced in construction disputes, land use, and all aspects of real estate development. We represent clients involved in every aspect of the construction industry, including breach of construction contracts, indemnity, payment claims and enforcement of lien rights, and construction defects. Our clients have included the owners, developers and builders of commercial buildings, office buildings, retail centers, healthcare facilities, hotels and resorts, shopping malls, and residential developments and subdivisions. A complicated construction litigation or real estate situation requires a law firm that will articulate the legal complexities in plain language so that you fully understand your options and are empowered to make well-informed choices and protect your investments. For over 20 years, KALIS, KLEIMAN & WOLFE’s partners have led and participated in construction litigation, real estate transactions and development projects that have helped shape Ft. Lauderdale’s skyline and Davie’s growth.